Lieutenant Colonel George Ridout Bingham took command of the newly raised 2nd Battalion of the 53rd Regiment of Foot in 1805, a position he was to retain until 1817. His letters, carefully retained by his loving family, begin with the arrival of the battalion in Portugal in April 1809 when they immediately joined Wellington’s army. George Bingham led his battalion at the battles of Oporto, Talavera, Fuentes d’Onoro, the siege of Badajoz, Salamanca (where he was mentioned in despatches) and the siege of Burgos. Following the terrible retreat back to Portugal following the failure at Burgos, the battalion was reduced to a mere shadow and was expected to return to England to recruit. However, Wellington wished to retain ‘veteran’ soldiers with his army in Spain and the 53rd was amalgamated with the 2nd (Queens Royal) Regiment, forming the 2nd Provisional Regiment, to which George assumed the command. This combined regiment then served at the battles of Vitoria, the Pyrenees and the Nivelle.Having been recruited, the battalion was reformed separately from the 2nd regiment again and served as such at the Nive. With the end of the war the battalion returned home and unfortunately did not take part in the Waterloo campaign. However, they did have one more important role to perform, that of forming part of the garrison of St Helena, guarding the deposed Emperor Napoleon. George Bingham sailed to St Helena on HMS Northumberland with Napoleon and his entourage and he noted all his conversations with the ex emperor. Once on the island, he commanded as a Brigadier General the entire garrison of the island for the Governor, Sir Hudson Lowe. George and Lady Bingham were favourites of Napoleon and visited him regularly, until George returned home in 1819. However, the remaining few years and death of Napoleon were fully described by the friends George left behind on the island. 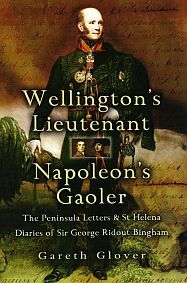 The series of letters and journals left behind by George Ridout Bingham form a major source of first hand material on Wellington’s army in Spain and perhaps more importantly a very important witness to the years of captivity of Napoleon. …it is worth a read to understand the life of an officer in Wellington’s army but will be of most interest to those who are interested in Napoleon’s captivity on St Helena.